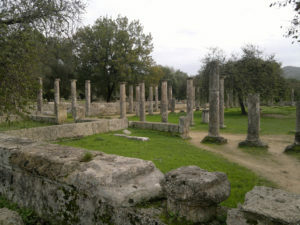 All options to visit Olympia from Athens in guided or private tours . 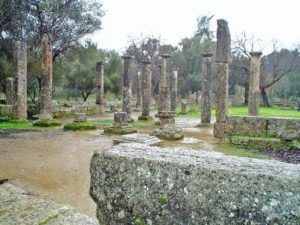 There is no other ancient site that has more relevance to today’s world than ancient Olympia, its history and the Olympic Games. Olympia is still in our lives with the lighting of the flame and the torch relay, ceremonies that every year will bring back memories of this tour. The archaeological museum and the museum of the ancient Games are among the finest in Greece, making your visit to Olympia a must. Over 50,000 spectators travelled from every part of the ancient World to compete in these Games and the winners became legends. The general setting at Olympia is magical. The whole region of Olympia is filled with history and beauty. It is not difficult to imagine the atmosphere during the ancient games so many years ago. There is no modern equivalent for ancient Olympia – a religious and at the same time an athletic centre. A major earthquake during the 6th c. AD resulted in a serious damage and flooded the whole site. The area was buried under the alluvial deposits of two nearby rivers until its re-discovery in 1852. Despite the damage by the earthquakes and the floods, the site is well worth your visit. Almost 2 millions of people visit Olympia every year and admire its wealth and importance in antiquity. A visit to the original site of the Olympic Games is a moving experience. Running in the original Olympic stadium is an unforgettable experience. one of the most interesting and educational sites you will find anywhere in Greece. Ancient Olympia had cultivated ideals. 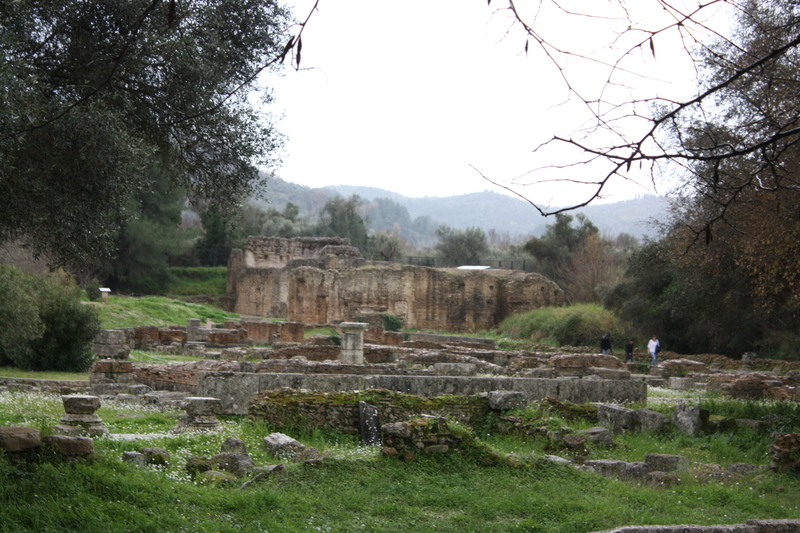 The ancient Greeks visited the sanctuary of Olympia every 4 years. The importance of taking part in the Olympics was a great honour, being an Olympic winner was even greater. Join one of the following tours and visit Olympia at least once in your lifetime. 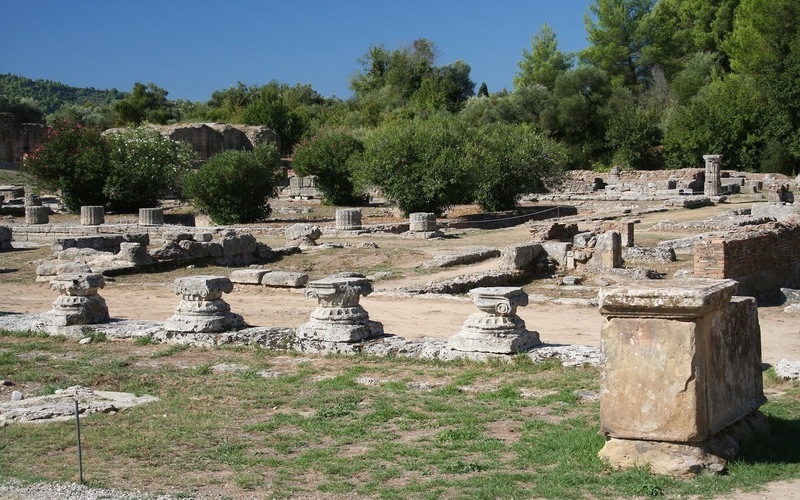 take our ONE DAY TOUR TO OLYMPIA and visit the huge, but walkable, sacred ancient site. * 3 days classical tour to Epidaurus, Nafplion, Mycenae, Olympia & Delphi from 225.00 € p.p. * 4 days classical tour to Epidaurus, Nafplion, Mycenae, Olympia & Delphi & Meteora from 320.00 € p.p. In the video Prof. Hale speaks about the sanctuary and the history of Olympia, a place that is still in our lives. Olympia cannot be visited from Athens as a day trip organized on a tour bus. It is outside the mileage and working hours of a bus driver, and the only way to visit it in a day trip is by hiring a car or a taxi, or by taking our private day trip, preferably with the extra expense of a local guide. 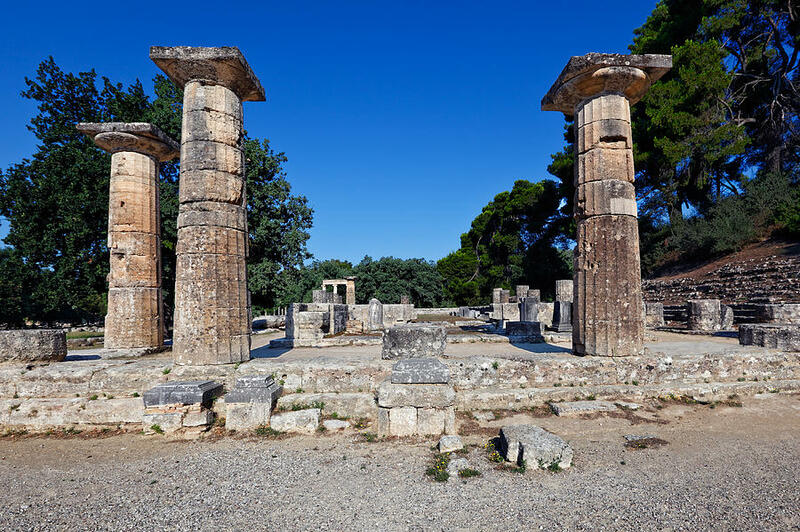 There are a lot of amusing myths and interesting stories about ancient Olympia and the Olympic Games that the tour guide will talk about. In the beautiful valley of the river Alpheios, in the Peloponnese, lies the most celebrated sanctuary of ancient Greece. Dedicated to Zeus, the father of the gods, it sprawls over the southwest foot of Mount Kronion, at the confluence of the Alpheios and the Kladeos rivers, in a lush, green landscape. Olympia became the most important religious and athletic centre in Greece. Its fame rests upon the Olympic Games, which was held every four years to honour Zeus. The origin of the cult and of the festival went back many centuries. Local myths concerning the famous King Pelops, and the river Alpheios, betray the close ties between the sanctuary and both the East and West. The earliest finds at Olympia are on the foot of Mt Kronio, where the first sanctuaries and prehistoric cults were established. A large number of pottery sherds of the Final Neolithic period (4000 BC) were found on the north bank of the stadium. Traces of occupation of the three periods of the Bronze Age were identified in the greater area of the Altis. A great tumulus of the Early Helladic II period (2800-2300 BC) was discovered in the lower strata of the Pelopion, while several apsidal structures belong to the Early Helladic III period (2150-2000 BC). It is believed that in 1200 BC the region of Olympia was settled by Aetolians under the leadership of Oxylos, who founded the state of Elis. The first sanctuary dedicated to local and Pan-Hellenic deities was established towards the end of the Mycenaean period. 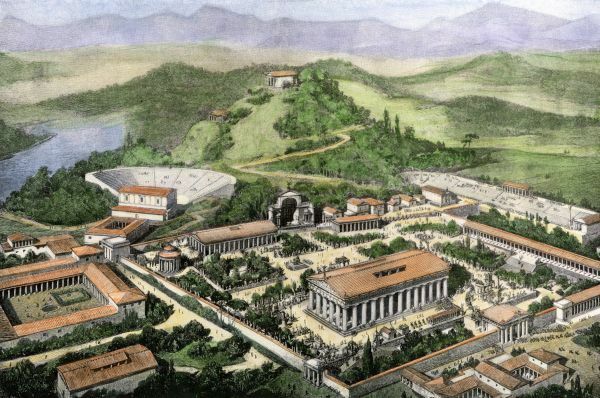 The Altis, the sacred enclosure with its shady oaks, planes, pines, poplars and olive-trees, was first formed during the 10th and 9th c.BC, when the cult of Zeus was probably established. 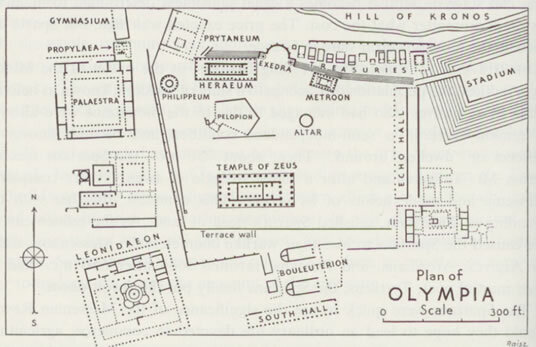 Olympia was subsequently devoted exclusively to worship and for many centuries had no other structures except for the Altis, a walled precinct containing sacrificial altars and the tumulus of the Pelopion. The numerous votive offerings, mostly figurines, bronze cauldrons and tripods were placed outdoors, on trees and altars. The first figurines representing Zeus, the master of the sanctuary, date to the Geometric period. 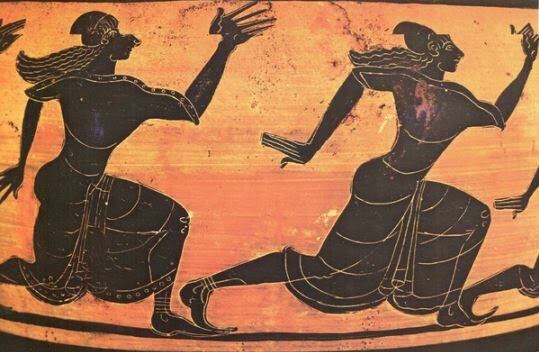 In 776 BC, Iphitos, king of Elis, Kleosthenes of Pisa and Lykourgos of Sparta reorganized the Olympic Games in honour of Zeus and instituted the sacred ekecheiria, or truce. Soon the quadrennial festival acquired a national character. The great development of the sanctuary began in the Archaic period as shown by the thousands of votive offerings – weapons, figurines, cauldrons etc – dating from this period. This is when the first monumental buildings were constructed – the temple of Hera, the Prytaneion, the Bouleuterion, the treasuries and the first stadium. The sanctuary continued to flourish into the Classical period, when the enormous temple of Zeus (470-456 BC) and several other buildings (baths, stoas, treasuries, ancillary buildings) were erected, and the stadium moved to the east of its Archaic predecessors, outside the Altis. The countless statues and precious offerings of this period were unfortunately lost, as the sanctuary was pillaged several times in antiquity and especially under Roman rule. In the Hellenistic period the construction of lay buildings, such as the gymnasium and palaestra, continued, while in Roman times several existing buildings were refurbished and new ones built, including hot baths, luxurious mansions and an aqueduct. Many of the sanctuary’s treasures were removed and used for the decoration of Roman villas. The sanctuary continued to function during the first years of Christian rule under Constantine the Great. The last Olympic Games were held in 393 AD, before an edict of Theodosius I prohibited all pagan festivals. In 426 BC Theodosius II ordered the destruction of the sanctuary. In the mid-fifth century AD a small settlement developed over the ancient ruins and the Workshop of Pheidias was transformed into a Christian church. In 522 and 551 the ruins were devastated anew by earthquakes, the Temple of Zeus being partially buried. In subsequent centuries the Alpheios and the Kladeos overflowed and together with landslips from Mount Kronios buried the site deep in mud and sand. Olympia remained forgotten under a layer of debris 5-7 metres deep. The area was dubbed Antilalos and it is not until 1766 that the ancient sanctuary was re-discovered. In 1829 the French Scientific Expedition of the Peloponnese partially excavated the Temple of Zeus, taking several fragments of the pediments to the Museum du Louvre. 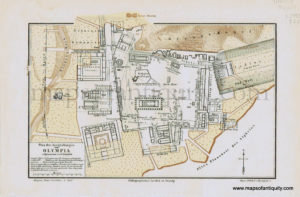 Systematic excavation began by the German Archaeological Institute in 1875 and continues to the present. During this last decade U. Sinn, Prof. of Classical Archaeology at the University of Wurzburg and member of the German Archaeological Institute, and his team researched the southwest building, while Dr. H. Kyrieleis, former director of the German Archaeological Institute, and his team excavated the Prehistoric buildings of the sanctuary. Several monuments of the site are currently under conservation and restoration. 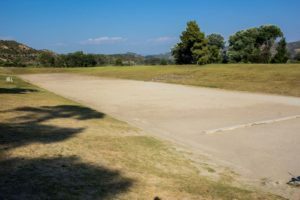 Olympia, site of the ancient Olympic Games. 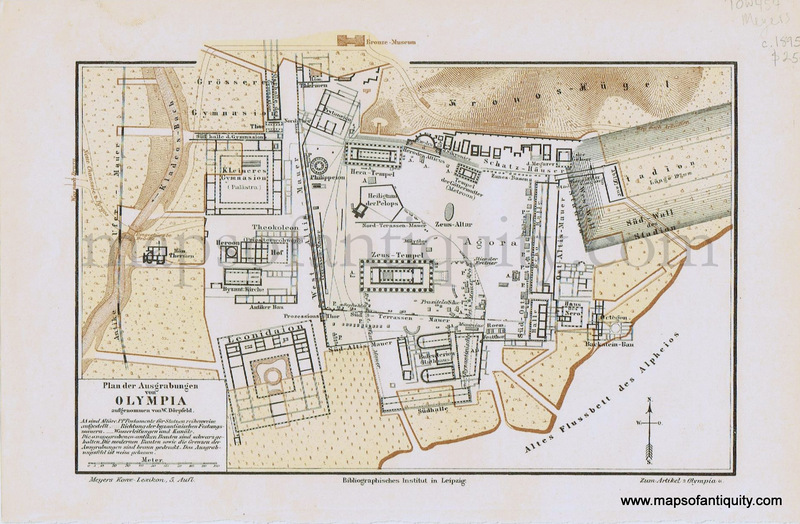 The archaeological site of Olympia includes the sanctuary of Zeus and the many buildings erected around it, such as athletic premises used for the preparation and celebration of the Olympic Games, administrative buildings and other lay buildings and monuments. The Altis, the sacred enclosure and core of the sanctuary, with its temples, cult buildings and treasuries, occupies the centre of the site. It is surrounded by a peribolos, or enclosure wall, which in the late fourth century BC had three gates on its west side and two on the south, and is bordered on the east by the Echo Stoa, which separates the sacred precinct from the stadium. The enclosure wall was extended in Roman times and two monumental entrances were created on its west side. 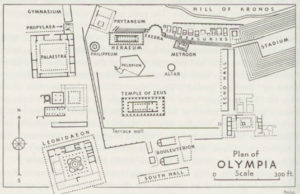 The Classical Temple of Zeus and the earlier Temple of Hera dominate the Altis. East of the Heraion is the Metro?n, a temple dedicated to Cybele, the mother of the gods, and behind this, on the foot of Mount Kronios, a row of treasuries dedicated by Greek cities and colonies. To their west lies the Nymphaion, a splendid fountain dedicated by Herodes Atticus. South of the Heraion and over the remains of the prehistoric settlement of Olympia is the Pelopion, a funerary monument commemorating the hero Pelops. Also within the Altis are the Prytaneion, the see of the sanctuary officials, and the Philippeion, an elegant circular building dedicated by Philip II, king of Macedon. Southeast of the Heraion was the great altar of Zeus, a most important monument entirely made of ashes and therefore now completely lost. The remaining space inside the Altis was filled with numerous altars and statues of gods, heroes and Olympic winners dedicated by Greek cities or wealthy individuals, such as the Nike of Paionios. Outside the sacred precinct of the Altis, to its south, are the Voulefterion and the South Stoa, the southernmost building of the greater sanctuary and its main entrance from the south. West of the Altis and separated from it by the Sacred Road is a series of buildings for the sanctuary personnel, the athletes and the distinguished visitors: the gymnasium and palaestra, exercise grounds, the Workshop of Pheidias which in Late Antiquity was transformed into a Christian church, the Greek baths with their swimming pool, the Roman hot baths, the Theokoleion or priests’ residence, the Leonidaion or officials’ quarters, and the Roman hostels. East of the Altis lies the stadium where the Olympic Games were held. The stadium of Olympia, where the ancient Olympic Games were held, and the massive temple of Zeus, are some of the attractions of the site. The best way to get the most out of your visit is to actually race in the stadium like the athletes used to do and feel the vibes! South of the stadium was the hippodrome, of which no trace remains as it was swept away by the Alpheios river. South of the hippodrome is a group of mansions and baths, including the famous House of Nero, built by the emperor for his stay at Olympia during his participation in the games. The Archaeological Museum of Olympia is one of the great museums of Greece, and houses artifacts found in the archaeological site of Ancient Olympia, abd surroundings. The museum was built opposite the excavation site, northwest of the Mt Kronion. Designed by Patroklos Karantinos, it was officially opened in 1982. It houses discoveries from the surrounding area, including the site of the Ancient Olympic Games. The collection includes objects produced and used in the area from prehistory to Roman rule time. The principal pieces in the museum are Hermes and the Infant Dionysus of Praxiteles, some objects from the Temple of Zeus, the Nike of Paionios, as well as a cup that belonged to Pheidias. The extent of its bronze collection makes it one of the most important in the world. The principal building has twelve rooms, organized around themes and ages of the objects. – One of the best known exhibits is the Nike of Paeonius. – The sculptured ornaments from the Temple of Zeus. Kosta gives excellent value for money. He is highly knowledgeable, caring and courteous. We shall definitely be booking another trip with him next year. I can highly recommend Astoria Travel and Kosta in particular. He went out of his way to assist my wife and me during our visit to Athens in early May. First, he got us rates in Athens hotels that were significantly lower than any we could book on the web. He gave us excellent advice about what would be open and what would be closed during a national strike on May 7, and booked us for a wonderful one-day cruise that day (at a rate lower than that advertised by other agents). I had trouble finding someone to take us on a one-day trip to Olympia, Kosta volunteered and drove us there and back. He also accommodated my request to visit the site of the Marathon battlefield–again, driving us personally, explaining the vicinity and the history, and recommending a cafe and several special Greek dishes for lunch. His English is excellent, he is knowledgeable, highly experienced, and extremely helpful. Tours from Athens to ancient Olympia, a place that must be included in everybody’s itinerary. Tours visiting Olympia - Astoria Travel, Athens.